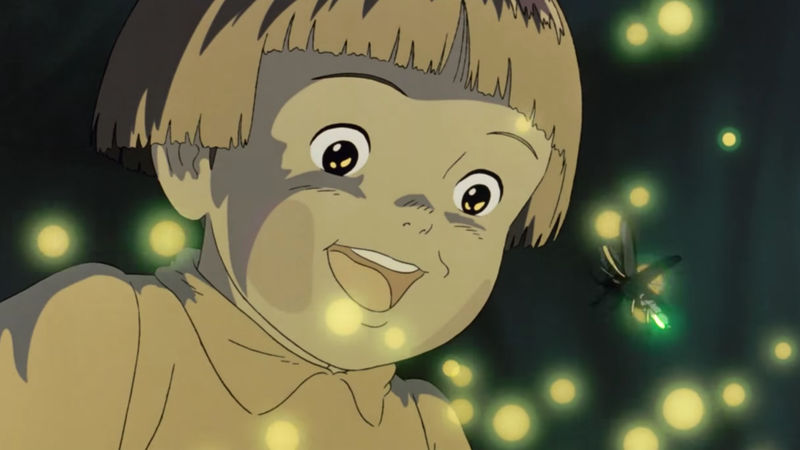 As anyone who has seen the film will tell you, Grave Of The Fireflies is sad as hell. Adapted for the screen and directed by the recently deceased Isao Takahata, the story follows two siblings in Japan during World War II who struggle to survive on their own after their home city of Kobe is destroyed by incendiary bombs. It’s the kind of movie you might watch because you’re starting to get into anime and think to yourself, “These Studio Ghibli movies are always pretty fun!” Next thing you know, your soul has been broken in two and you can’t stop crying. Now, on the 30th anniversary of the film’s release, some have discovered that even the film’s poster was darker than we realized. Like the film itself, the poster creates a haunting juxtaposition between the innocent playfulness of childhood and the truly unimaginable horrors of war. But, also like the film, the poster isn’t upfront about the fact that this is the kind of movie you’re getting into. The darkness is a bit obscured, which makes it that much more devastating when it all comes crashing down.